With the British threatening Philadelphia in 1777, Sarah “Sally” Wister and her siblings had been taken by their parents for safety to a relative in North Wales, Pennsylvania. The well-educated sixteen-year-old was delighted when General William Smallwood of Maryland, asked to use the house as his headquarters. Unable to post letters because of the fighting, she chronicled her flirtations and other news in a journal for her best friend Deborah Norris in Philadelphia to read later. Third day [Oct. 28] . … when will sallys admirers appear? ah that indeed. Why Sally has not charms sufficient to pierce the heart of a soldier, but I won’t dispair. These excerpts are from In the Words of Women, Chapter 4, pages 116-17. 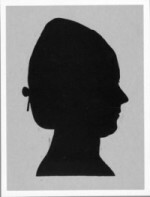 Sarah Wister’s silhouette is in the Portrait Collection of The Historical Society of Pennsylvania.